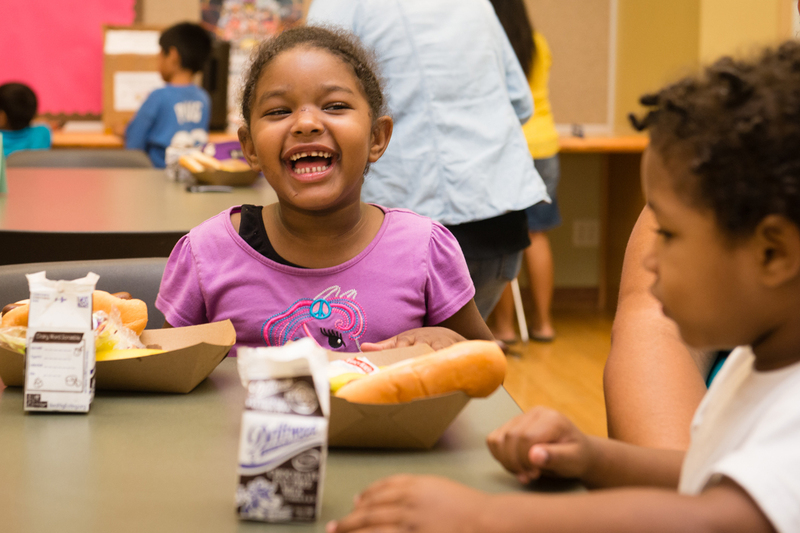 Lunch at the Library programs support kids from food-insecure households and underscore the evolving roles of libraries. School districts across the U.S. are beginning to close their doors for summer vacation, giving students a respite from classes and exams. But for millions of young people from food-insecure households, there’s less to celebrate—because summer break puts an end to the free and reduced-price lunches they’re eligible for during the school year. The library’s decision to feed kids instead of ejecting them was quiet testament to the long, lingering shadow of food insecurity, which, despite some fluctuations, has remained consistent at around 12 percent of the nation’s households since the U.S. Department of Agriculture (USDA) began tracking it in 1995. (That figure is 14.4 percent in Alameda County, which encompasses Oakland.) “A very basic need was not being met and we realized, these kids just need to be fed,” says DeMay. At the California Library Association (CLA), program director Natalie Cole watched Oakland’s summer lunch experiment with interest, while amassing reports from librarians in other parts of the state about encounters with ravenous kids acting up and asking for snacks. 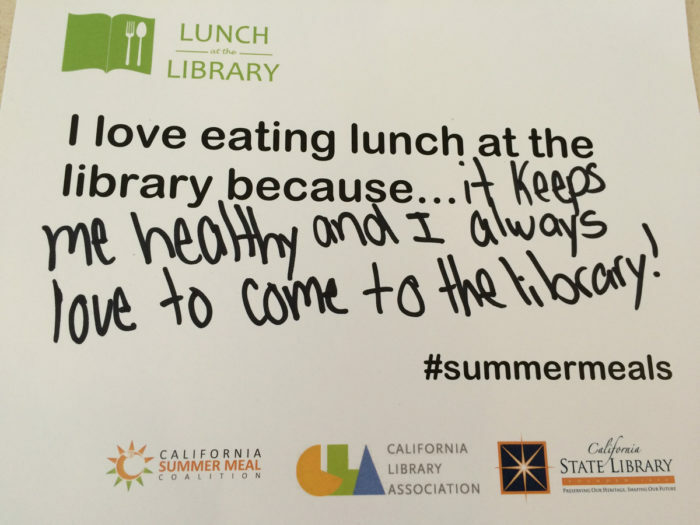 In 2013, she and Patrice Chamberlain, director of the California Summer Meal Coalition, received a private grant to follow Oakland’s lead and pilot a summer lunch program at 17 California library branches. This year, 198 public libraries across the state will serve an estimated 275,000 free meals, all fully reimbursed by the USDA, through the Lunch at the Library program that Cole—who is now program consultant at the California State Library—and Chamberlain established. 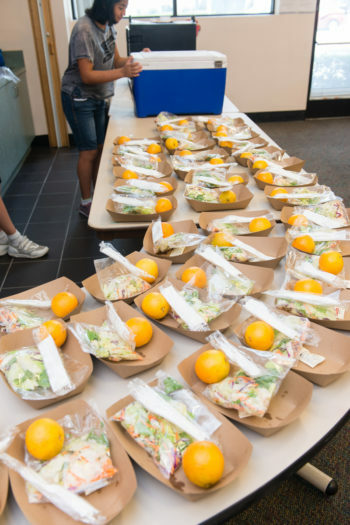 Libraries in Ohio and other states have also adopted coordinated summer lunch programs in the wake of California’s efforts, although no one is keeping an official national tally. Federally reimbursed summer lunches have actually been available for more than three decades. The USDA, which declined to comment for this story, enacted the Summer Food Service Program (SFSP) in 1975 in order to bridge the summer feeding gap. By 2011, the year the Oakland libraries started serving lunches amid their stacks, the USDA was reimbursing more than 130 million meals a year, served at community-based sites across the country (including the Oakland libraries) over the three-month break. In California at least, those sites were often, logically, schools; kids were already congregated there for summer school and enrichment programs, and schools had the means to cook and serve food. But the 2008 financial crash caused schools to scale back their summer offerings. As a result, Chamberlain says, more than half the sites serving summer meals fell away—although, even before the crash there weren’t enough “to accommodate all the kids in need.” In fact, California misses out on millions of dollars worth of federal aid, partly because it has too few sites. If a school without summer programs continued to serve lunch anyway, kids were less likely to turn up for it. Transportation was, and still is, an issue, and with no programs, there were no school busses to shuttle kids around. Stigma is also a barrier. “[Kids] stand out when there are no activities” for them, says Chamberlain. In this context, libraries-as-lunch-sites begins to make a lot of sense: They’re often centrally located, offer books, activities, coveted air conditioning, and safety, and the USDA doesn’t require them or similar participating sites—including Boys & Girls Clubs, local parks, recreation centers, and churches—to ask for proof of need; Anyone under the age of 18 who shows up eats for free, no questions asked. There are obstacles to bringing in California’s 1.7 million summer-hungry kids to libraries, however. Finding the space to serve lunch at tables in the reading room or elsewhere, such as the foyer—where some busy branches set up—can be challenging. And sites all need sponsors. These can be school districts, food banks, or YMCAs that do most of the heavy lifting in terms of finding a vendor to make food and deliver it, training and hiring staff, keeping track of meals served, and filing for reimbursement. But getting the word out to families in need is also challenging. “Schools try to reach [them] before summer, but a lot of times it’s a flier [that just gets] shoved in a backpack,” says Chamberlain. For a site to be eligible for SFSP, 50 percent of kids in the area must qualify for free or reduced-price school lunch. In a city like Oakland, for example, where high rents have pushed out some residents, or wealthier residents may skew stats for their lower-income neighbors, some critical sites might no longer qualify. And some overtaxed librarians balk at serving meals. Cole says she frequently hears concerns, including fear of chaos and mess, resistance to taking on responsibilities that are “not our job,” and worry over dealing with stringent USDA regulations. For instance, some locations receive hot dishes from their sponsors, like the “taconados” and corn dogs served at Southern California’s Ontario City Library, which must be served at a precise temperature. Advocates, though, say the effort is worth it, since the program allows libraries to pull in new kids, then sign them up for reading programs and library cards. Los Angeles Public Library (LAPL) branches offer an ever-changing roster of science, technology, engineering, arts, and math (STEAM) activities at their summer lunch sites, which, says LAPL’s youth services director Eva Mitnick, gives kids in high-needs communities access to fun science learning they may not get at school. Adult caretakers, who are not eligible for free SFSP meals, can access helpful information at libraries about strengthening their resumes or enrolling in citizenship classes; in some locations, food banks and local farmers give away fresh produce. Many sites also attract teen volunteers who can earn community service credit, gain career training, and learn “how to be stronger citizens,” says Courtney Saldana, Ontario City Library’s youth services supervisor, who is thrilled for teen help during the three daily lunch seatings she juggles at the main branch to meet overwhelming demand. Some libraries pay the $15 fee for teens’ food-handler certificates, which they can also use to get restaurant jobs. Still, there’s room for improvement. Chamberlain would like to expand Lunch at the Library to affordable housing communities—with libraries bringing in bookmobiles and story-time sessions. Crystal FitzSimons, director of school and out-of-school programs for the Food Research & Action Center (FRAC), which promotes summer lunch nationwide, thinks lowering free-lunch-qualifying site requirements from 50 percent to 40 percent will increase access to kids in need, as will convincing municipalities to fund their transportation. Which circles back to Lunch at the Library’s main hurdle: increasing the number of sites. Chamberlain hopes to double the number of California’s library participants over the next 10 years. Saldana has offered a loud supporting voice to that effort since Ontario City started serving lunch in 2015. “If somebody needs it, the library should provide it—and to walk into a room and see hungry kids being fed is a slap in the face” to “traditionalists” who think their sole job is providing reading materials to patrons, she says. Top photo © Becky Ruppel Photography. My library in Maine does this. So proud! 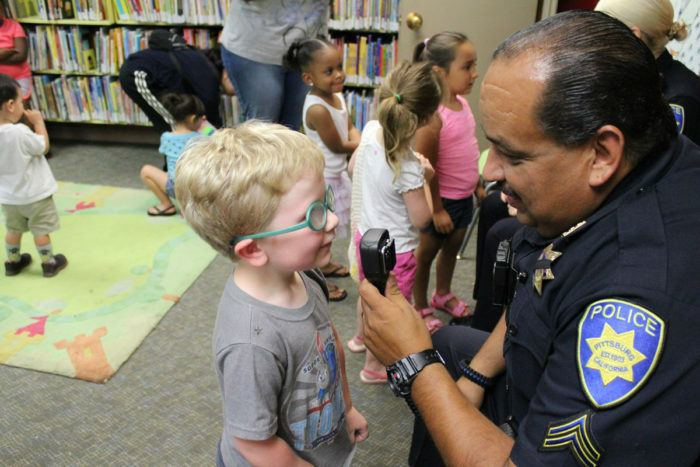 How do we volunteer at one of these Oakland Libraries this summer. Thank you.